For this post I thought I would show one of the knots that I have been working on recently. JD at TyingItAllTogether created the original version of this knot and published a video on the tying technique. The original design is great, but when I started fiddling with a few strands of cord the other day I thought I would see how it looked in a "wide" form. I am labeling this knot as a prototype because I don't know how useful folks will find the design since it is wider than most lanyard knot designs. With your feedback I will determine if a tutorial should be made. 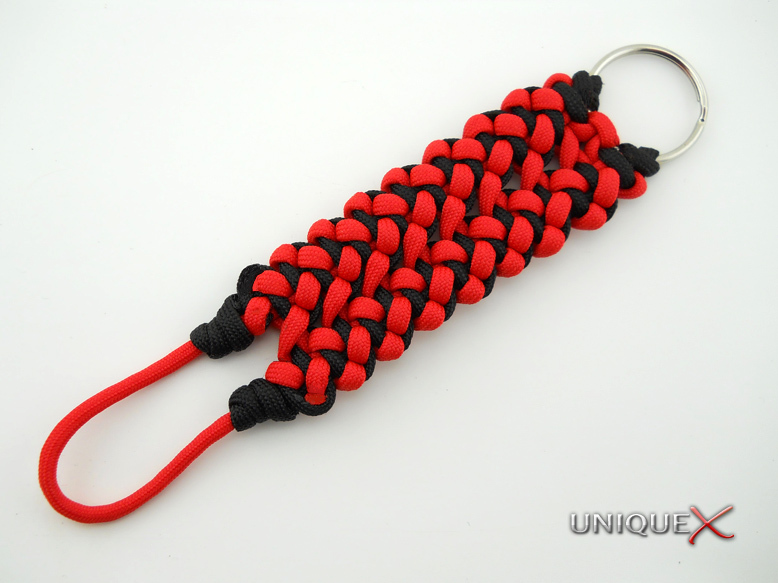 Perhaps not as a lanyard, but it might make a great shoulder strap or a luggage handle. @Norm, you are correct, it would be very useful as a handle because of the stiffness of the knot. Great design! It looks beautiful! I think everybody will find this design useful. that could come in handy with a lot of different uses. lets have a tutorial. @ShirCraftalot: Thanks for the support! Since the original publication date of this post, a tutorial has been created for this design, it's not exactly finished the same way, but you will learn how to tie the "Wide Cobbled Solomon Bar".